It's funny, because I've been so garment and shawl focused for so long that I wasn't even sure I should keep buying the yarn, but I've become addicted to sock knitting. Most people equate sock knitting with warmer weather. No one wants to knit a large woolly when they are sweating by the pool (yes, here in the South we do knit by the pool). But for some reason my sock mojo has been for naught in the past year. I have a few single socks that I knit when Pasha was born and I was able to knit while holding him. But with the exception of my mom's socks they have been conspicuously absent from the rotation. Until now. I cast these on the week before Thanksgiving and had them finished and on my feet within two weeks (I did some other knitting in the middle there). As soon as I saw the pattern go live I knew I had the perfect yarn -- Woolen Boon in Buffy. I had intended this yarn to be a hat when we went to see Garbage and Blondie, but the jerks at security wouldn't let me take my needles in, so it had languished in a project bag for a few months. I paired it with a vintage Junkyarn mini skein (I say vintage because I got it when she first started dying and I have no idea what she called the colorway). I'm in love with the way the cuff looks with just a hint of pink in the cast-on. Of course it wouldn't be a Faith sock without some modifications. I knit the leg a little shorter than called for because I prefer a shorter sock. I have runner's calves (without having run in quite a while other than to stop Pasha from pulling the tv over on his head), so I would need a bit of an increase at the top for longer socks. I then subbed in my favorite short-row heel for the one called for. I used to worry that short row heels are not as hard-wearing, but I have so many socks in my drawer at this point that the only ones getting constant wear are my shorties. I also reduced the stitch count for the foot. The pattern calls for a larger stitch count on the leg to accomodate the cables, but I wanted to be sure it had more ease for the rest of my foot, so I decreased down to my standard 56 stitches. Ironic because as soon as I finished knitting them my feet started swelling (yay pregnancy) and I could do with a little less ease. However, I pulled out my oft-neglected sock blockers and the result is a much more comfortable fit. 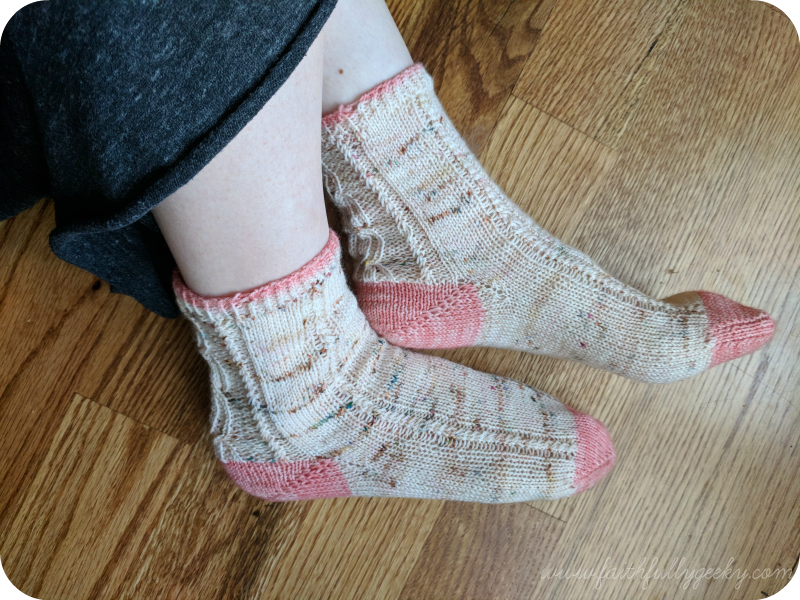 Would I recommend this sock pattern? Heck yes! I might have another planned though it will be a while before I am able to wrangle a cable needle again (typically I cable sans cable needle, but on such a fine gauge with a toddler running about I decided not to chance it). The temperature has dropped enough that I am reaching for a pair of socks every day, so expect to see more sock wips soon!